Suit up! Jump into hyper flight with the four Wikk kids! Forced into a high stakes hunt for their missing parents by the sinister Cpt. Vedrik, the siblings' only hope is their parents' Archeos e-journal. Can Tiffany decipher the clues within it? As time runs out, it's all up to Oliver and his Federation training to fly the Phoenix and protect his crew. But twins Mason and Austin endanger the mission when they unexpectedly meet...the blue boy! The Quest for Truth series unfolds as the four Wikk kids are thrust into a desperate race to find the mysterious planet Ursprung and stop the übel renegades from misusing its long-lost secrets. Ancient cities, treacherous villains, high-tech gadgets, the Phoenix-encounter: all of these and more on this futuristic, interplanetary adventure! Myself and my sister both enjoyed listening to this book. I am looking forward to hearing the rest in the series. Seventeen-year-old Oliver just came back from his first year at the Academy and he is getting ready for a trip with his parents and siblings. Everything is ready at the ship but their parents are missing. Oliver decides to go home to see if their parents are there, and discovers that they were taken by the Übel renegades. Oliver's parents are archaeologists, and their main mission is searching for Earth sprung, but their work is more important to some than Oliver thought. The four siblings will go on a dangerous mission to try to find and rescue their parents. The beginning of this book made me think of a science-fiction Indiana Jones adventure for young readers, even though I am sure adults will enjoy it too. It is an action packed book in which the characters' ages range from eleven to seventeen, and there is not a moment of boredom. It could perfectly be a five star book but it is a shame that none of the many questions is answered. It is not only that it ends on a major cliffhanger, but I have the feeling that it is part of a longer book. There are a lot of hints here and there and I am sure there is a great story behind it, but this book just merely skims the surface. It really leaves you wanting to continue reading just because it feels it ends in the middle of the story. I understand it is just the first book of a series, but I think it is necessary to give at least a conclusion at the end of each book to avoid frustrating the reader. There is something I listened to in the book that I did not like, and it was about evolution, meaning that the characters did not believe in it. I do not know how the story will turn out in future books, but this point worries me since evolution is a fact. L.C. Kane did a very good job narrating this story and transmitting the character's emotions. She made the story work perfectly well. I found an editing issue though; around 15:36 there is a small gap in the audio. It does not impair the story but it is a pity when this happens. I would like to continue the series though, since I think the subject is extremely interesting and we are bound to an exciting ride. The book was fine, but was not my favorite YA story. I am sure it would appeal to a much younger listener. The twin boys in the story were very irritating. Never having had twin boys, I am not sure if that is typical behavior. There was a major cliffhanger, so you need to listen to the next book to find out what happens. Awesome Narration That Makes Taken Come to Life!! Definitely! I think anyone could get drawn in very quickly. I sure did. I loved how everything began so smoothly for this series. We jumped right into the plot and got to know the characters and their personalities. It was almost like I was there with them all. Such an intriguing adventure! I loved how she narrated everything. The emotion when the scene needed it, like in the prologue. The different voices for the different characters. Just the little things I noticed that made it all the more amazing. It reminded me of audio dramas. Taken by Brock Eastman takes you on a thrilling ride through outerspace to meet blue men on a whole other planet. Our family has really enjoyed listening to this book while we run errands and even while we took down the Christmas tree. Our favorite part was the hyper fight sequences because they showed what technology would be like in the future. Oliver, Tiffany, Mason, and Austin are characters that My son really enjoyed. Oliver is the oldest in the family and is a great leader. Even though he is only 17 years old, Oliver feels a great deal of responsibility when his parents were kidnapped by the evil Übel and is forced to use his specialized training to fly a spaceship, travel to a new world, and investigate where when his parents were before they were kidnapped. His sister Tiffany is a specialist at electronics and research. The adventure was super and the whole family found it very entertaining. Taken is an excellent book about a family of four kids who want to save their parents. The narrator did a good job changing the voice for the girl and three boys. The book has the perfect balance of character, comedy, and frustration. It is the kind of book that you're relieved has a sequel. 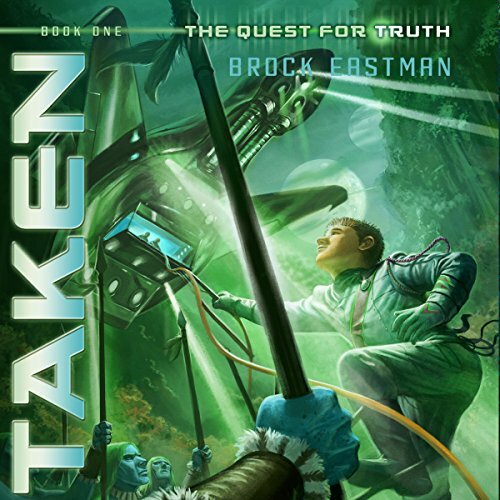 Where does Taken rank among all the audiobooks you’ve listened to so far? Our family as a whole loves this series - 2 parents, 8 y/o girl, 6 y/o girl and 4 y/o boy. We listen in the car mostly but sometimes just can't take waiting and listen at home also. Mom and my two girls are probably the most obsessed and this is in our top 10 audiobooks for sure! We love the family-friendly adventure. This is a story that is probably meant for kids in the YA audience most (maybe older elementary-tween-teen?) but we all love it and I as a parent appreciate the appropriate nature of the content and the integrity and respectfulness in the characters while still listening to intense adventure. I like how the author has them "think through"/talk through attitudes and motives. I'm not sure we can choose - we love all the characters. And they each have their strengths AND weaknesses. One daughter loves Tiffany most. Mom is torn between Oliver and the twins but appreciates when they work out their differences together and recognize mistakes and apologize for them. I will say that when we first started listening (first couple chapters) I as the adult wasn't sold on the narrator - it seemed very "cold"....but I was soon won over and realized that it has more subtle nuances and the "evenness" of the narrator actually lends perfectly to the settings/time period of the books. I don't think she has a huge differentiation in voices for the characters but it doesn't deter us from listening. ALSO - we have the hard copies of The Quest for Truth books and are reading them as well as listening (we're further along than the audible versions so far). I HIGHLY recommend listening to the audible of the 1st book (Taken) either before or while reading the hard copy. It is so helpful in hearing the names/words of the characters that we wouldn't know how to pronounce and so now as we read the books ourselves (either as family read-alouds or my 8 y/o on her own), we read with the pronunciations as intended! We got a clearer picture of the characters by listening to the audible narration! A fun book to listen to with your kids. I got this book thinking I would listen to it to see if it would be a good book for my son to read. Not too far into the book I found that this was a book I could really enjoy too. This book starts off with a fast pace. The family is separated when the kids have to run and take their family's space ship to get away from the people who took their parents. Not really knowing what to do without their parents, they set a course for the planet where they hope to find someone who can help them, and give them the answers they need to find, and save their parents. The twins get themselves into all kinds of mischief and have to find a way to escape the elusive blue people who have taken them captive. Overall this was a really fun read. It's definitely targeted toward kids, but it would be a great book to listen to on a family car ride. "This audiobook was provided by the author, narrator, or publisher at no cost in exchange for an unbiased review courtesy of AudioBoom dot com."